New William McDowell Album On The Way! Get Ready! The man that brought you the worship anthem, “I Give Myself Away” has a set a date for his next album. 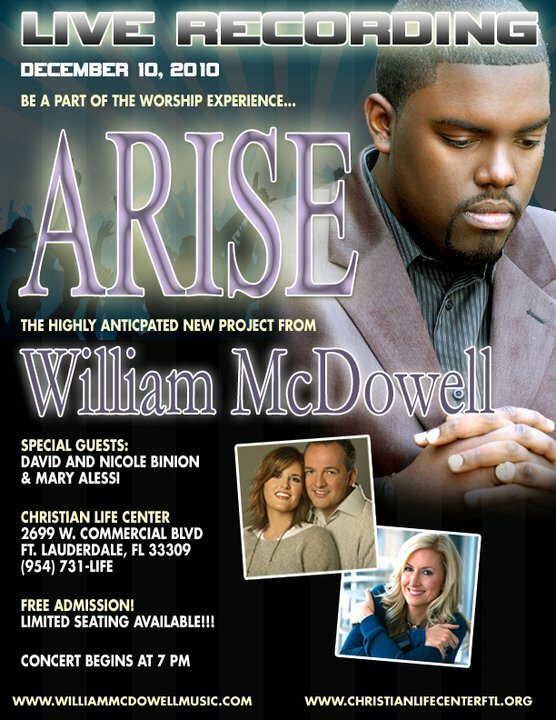 The live recording of “Arise”, will take place December 10, 2010 at Christian Life Center in Ft. Lauderdale, FL at 7:00 p.m. Guest on hand for this album will include David and Nicole Binion and Mary Alessi. William’s current album, “As We Worship” remains a favorite on Billboard Radio and Gospel Charts. This entry was posted on Thursday, November 11th, 2010 at 2:59 pm	and is filed under Artist News and Updates, Billboard Charts, Recording Events. You can follow any responses to this entry through the RSS 2.0 feed. You can leave a response, or trackback from your own site.